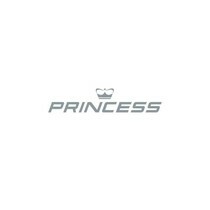 Princess has been around since 1965, creating amazing and durable vessels with high-quality standards. With more than 2,000 employees and 1,100,000 square foot shipyards, this builder is serious about two things: quality and heritage. 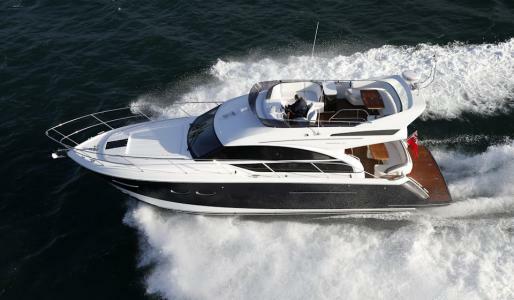 Today, we’re going to explore the Princess 43, a multi-award winning design from this brand. Let’s start with the deck. It has a teak laid transom platform, cockpit deck, flybridge stairway and stairs to side decks which allow you to move from space to space easily and safely. It also features a reversible electric anchor winch with foredeck, helm position and flybridge control with self-stowing 20kg/44lbs Delta anchor with 40m of chain. Of course, as most Princess’s models, it also includes stainless-steel cleats, fairleads, handrails and a dual station remote control searchlight. The cockpit is a nice and luxurious space to have great times offshore with your crew. It features upholstered seating with a folding teak table and a self-draining overboard-vented locker for two gas bottles. Other features include locker housing with 240V support inlet, a lockable gas strut assisted hatch to the engine room and twin transom gates leading to the bathing platform. Its transom bathing platform with foldaway swimming ladder includes a hot and cold shower for better comfort. Next, the Helm Station. With dual instrumentation, controls and alarm system including VHF/RT, speed and distance log, echo sounder with alarm and autopilot you can feel empowered and safe while cruising. It features twin helm seats with fore and aft adjustment for comfortable cruising, full engine instrumentation including fuel gauges, exhaust temperature and engine warning system and rudder position indicator, navigation system including VHF/RT, speed and distance log, echo sounder with alarm, autopilot and high speed magnetic compass, and controls with indicator for bow thruster, windscreen wipers, bilge pump and trim tabs. Included is a chart table with light and chart stowage, 24v and 220/240v electrical control panels, a black mesh sunscreen, a 12v outlet, red night lighting for safety purposes and a sliding tinted side window adjacent to the helmsman. Just beside the Helm Station we find the Flybridge, an amazing area with extensive space and entertainment features. In terms of comfort, there is large U-shaped upholstered seating with a folding teak table and an L-shaped seat that converts into a sunbed. Loudspeakers linked to the saloon stereo and a refrigerated top loading cooler box are included too! The Deck Saloon or Saloon features a U-shaped sofa with a dining table to starboard that converts to a double berth, a moveable two-seater sofa and a stereo with MP3 player with saloon and flybridge speakers. This space also features sideboard units with glass, bottle and general storage as well as space for an optional refrigerator or an optional TV on electric raise/lower mechanism. The Galley features a 3-zone gas hob with flame-failure device, a hob extractor and a waste bin for safety. A combination of microwave and conventional oven with an electric grill, and a stainless-steel sink with monobloc mixer tap is present. This space has a refrigerator with a freezer compartment, dedicated crockery and cutlery stowage, a chopping board, some under-floor storage compartment and lift up stairs with storage compartment and provision for a washer and dryer. Now let’s explore each Cabin. The Owner’s Cabin features a large double bed with drawers below, a wardrobe with shelves, vanity unit, storage lockers and drawers, a deck hatch with flyscreen and blinds, overhead and individual berth lights and an en-suite bathroom. The Guest Cabin has two single beds with storage below (with the option of powered sliding berth), a bedside table, a wardrobe with shelves, storage lockers and drawers, overhead and individual berth lights and an en-suite bathroom with day access. All cabins feature opening portholes and 220/240v power points, all mattresses are pocket sprung. The bathrooms also have opening portholes and full shower stalls, electric quiet flush toilets, extractor fans and 240v shaver points. For the furniture you can choose between Serotina Cherry and Light Oak with satin or high gloss finish. American Walnut or Rovere Oak are also available as options. All the worktops and tiled floors in all bathrooms are made in avonite, the same with the galley worktop and timber-laid floor. There are curtains, blinds or sunscreens on all windows and portholes. This Princess 43 is powered by two Twin Volvo Penta D6-435 (2 x 435mhp) or you can choose the optional Twin Cummins QSB6.7-550 (2 x 550mhp). Its power and drive systems feature 4-bladed propellers in nickel aluminum bronze, a power-assisted electro-hydraulic steering system with hydraulic back-up, an electronic engine and gear shift controls, an engine room extractor fan and dripless shaft seals. Its fuel system includes fuel tanks (in NS8 marine grade alloy) with an interconnection system giving 300 gal/360 US gal/1,363l capacity and fuel fillers on port and starboard side decks. And its water system consists of 93 gal/112 US gal/423l plus 7 gal/8 US gal/32l hot water calorifier, heated by engine and 240v immersion heater, automatic or manual override fire extinguishers in engine room with warning system at both helm positions and four hand-operated fire extinguishers in forward stateroom, starboard cabin, galley and lower helm. It has a L.O.A. of 47ft 6in (14.5m) a beam of 13ft 11in (4.25m) and a draft of 3ft 9in (1.14). Its fuel capacity is 300 gal/360 US gal/1,363l and its water capacity is 100 gal/120 US gal/455l. This Princess 43 is a dynamic boat with the best features and the Princess’s guarantee to back it up. Are you serious about spending quality, perfect times offshore? Then check out our virtual tour and get to know this model better!